We have a great hair & beauty team at the MIttel Salon with many years of experience between us, gained from salons in Germany, Australia and of course, the UK. We're a friendly bunch and we like meeting new people, so we look forward to new customers coming to our salon. As the owner of Mittel Salon - I’ve been cutting hair since 1985. These days – my role is more of Salon Manager, but I still cut occasionally. I also take care of the majority of our beauty treatments. I also run and operate the Mittel Sports Injury & Therapy Clinic. 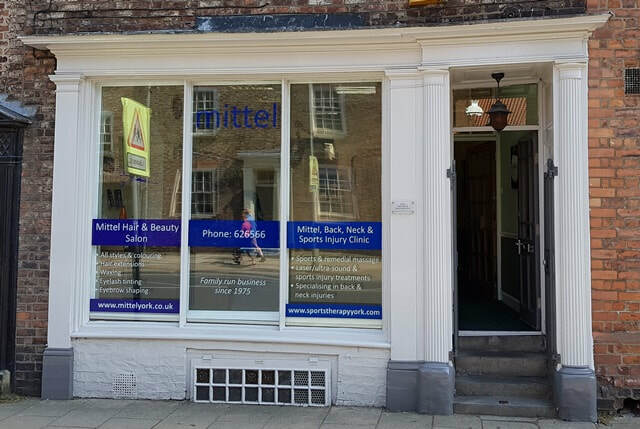 At Mittel Sports Therapy Clinic I'm the Senior Sports Massage Therapist and have been successfully treating sports, lifestyle and workplace injuries for over 20 years, and my mother before me for a further 20 years. Over that period of time we have assisted thousands of York residents become pain free. To date we have had several comments / thanks books in our reception. I only feel it right to transcribe some here on the site, as I feel that so many people would use not just mine, but other sports therapists if they could believe that it was possible to relieve the pain that they've simply just got used to over the years. If you're undecided, hopefully some past and current clients can assist you in making the leap of faith into a new pain-free life (Inserts below are from my comments book). "I'll be here, looking forward to meeting and assisting you", Debbie. Please call me on 01904626566 today. ​Claudia has been cutting hair since 1991 and working at the Mittel Salon since 2005. Originally starting her career in Germany, Claudia has also worked in France and Australia, but fortunately for us, she now chooses to live and work in York. She’s our most senior stylist, a hair colour expert and very popular with our customers – so you’ll need to book early! Has been with Mittel since she was 15 years of age starting as our Saturday assistance leading to Ellie studying at York college & in house training with Claudia & Debbie to complete her apprenticeship she is now a valuable part of our team as our junior stylist building her own clientele in her final year of her Improver year .